My dual-screen setup involves a MacBook Pro and an external Acer flat panel, but despite my own preferences, I've kept the laptop screen as the primary to avoid a font rendering issue. For reasons that were unknown to me, iTerm 2 would display a nice, thick font when the laptop was the primary screen, but a very thin font when the Acer was primary. 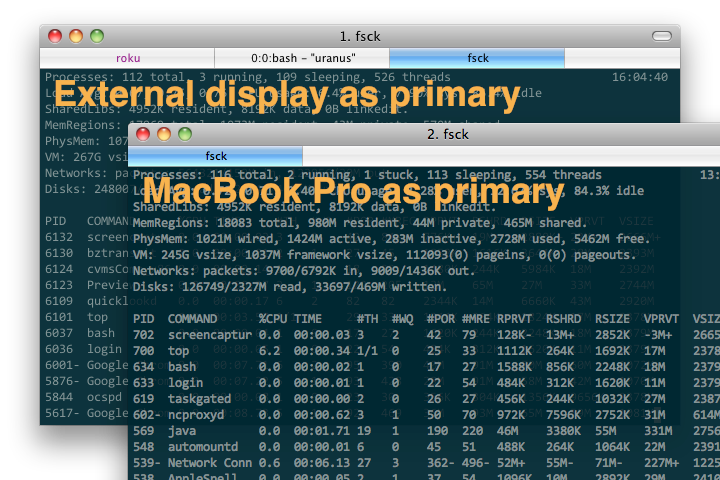 Switching the primary and relaunching iTerm would cause the thickness to change. I first experienced the issue in Mac OS X 10.6, and it persisted into Mac OS X 10.7. I've recycled the bug report-quality screenshot above as an example of the difference. Thanks to Steve Kuo for the solution.